Much of the debate has been overshadowed by intense lobbying from pro-gun groups. They argue that current rules are good enough and that the problem is that some EU states are not applying them. Pro-gun groups get not paid by the “gun lobby”. They work unsalaried for their own interest. “Lobbying is an integral part of a healthy democracy, closely related to universal values such as freedom of speech and the right to petition of government. It allows for various interest groups to present their views on public decisions that may come to affect them. It also has the potential to enhance the quality of decision-making by providing channels for the input of expertise on increasingly technical issues to legislators and decisionmakers.” (Burson Marsteller, A Guide to Effective Lobbying in Europe: The View of Policymakers, 2013). 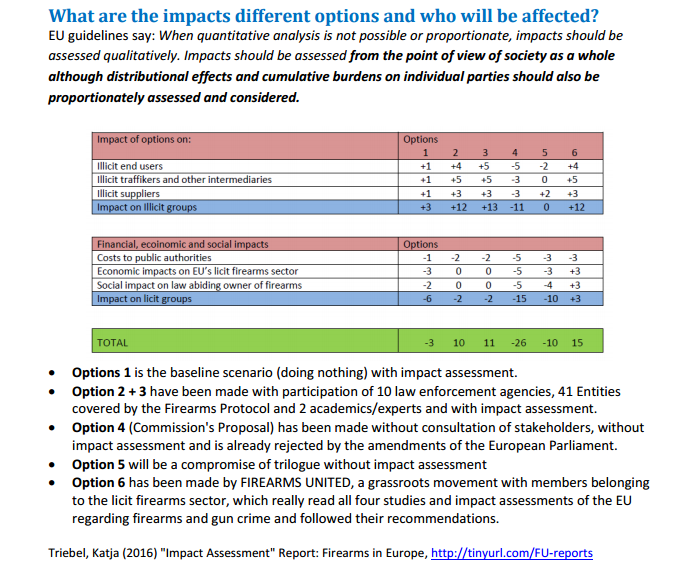 Firearms United, a confederation of gun owners throughout Europe, collected over 337,000 signatures against the commission proposal. The lobbyists also found allies within the EU parliament. One lobbyist claimed the parliament copy-pasted his position on people who collect guns. Petroni spoke freely and admonished the commission for including collectors within the scope of the directive. He then said that FESAC had even drafted the parliament’s text on collectors. In his speech in Parliament on the 16th November, FESAC’s chair Stephen A. Petroni referred to the definition of a collector, which was to be found in the current texts of both Parliament and Council. This is hardly surprising as FESAC had been asked to write such a definition in response to a Europol request months before the Commission published its proposal. 1.k For the purposes of this Directive, “collector” means any legal or natural person dedicated to the gathering and conservation of firearms or ammunition for historical, cultural, scientific, technical, educational or heritage purposes, (…) and recognised as such by the Member State concerned. FESAC remains committed to fight for the reinstatement of recognised collectors exemption from the provisions of the Directive, arguing that the Commission did not present any evidence that the members of this community are a ‘possible source of trafficking’, as the Commission slandered them as a pretext to bringing then into the Directive in order to shift the regulation of collectors from member state level to within its own grasp. British conservative Vicky Ford, who steered the bill through the assembly, told gun groups in November that she had wanted to “reject the entire thing [the commission bill]” but was met with resistance from too many MEPs. 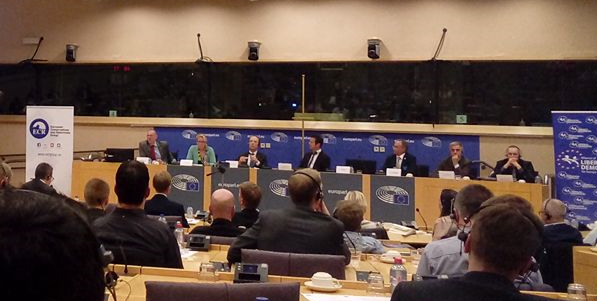 The British MEP was speaking at an parliament conference co-organised by Firearms United. The wording is a subtle attempt to tarnish Rapporteur Vicky Ford’s reputation by implying that she was partial to the demands of FIREARMS UNITED and other groups that represent legal firearm owners. Alain Alexis from the European Commission attended that same Conference and spoke during one of the panels. Even the option of not revising the current Directive will yield results in the fight against illicit trafficking that are better than implementing the text that resulted from the Trilogue discussions! 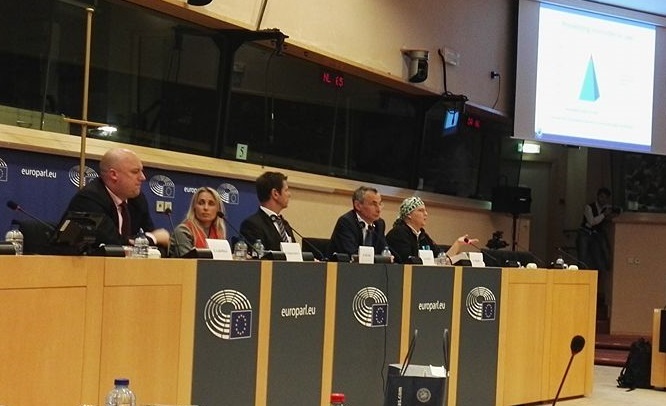 Among the speakers was Stephen Petroni, as head of the Malta-based Foundation for European Societies of Arms Collectors (Fesac). Fesac is not listed in the EU’s join-transparency register. Unregistered lobbyists are meant not to be allowed inside the parliament. Petroni is also a board member of the European Sports Shooting Forum and President of Association of Maltese Arms Collectors & Shooters. They are not registered either. This statement shows that Stephen Petroni ruffled the Commission’s feathers to the extent that it is retaliating by making a ridiculous and unfounded accusation through this reporter. 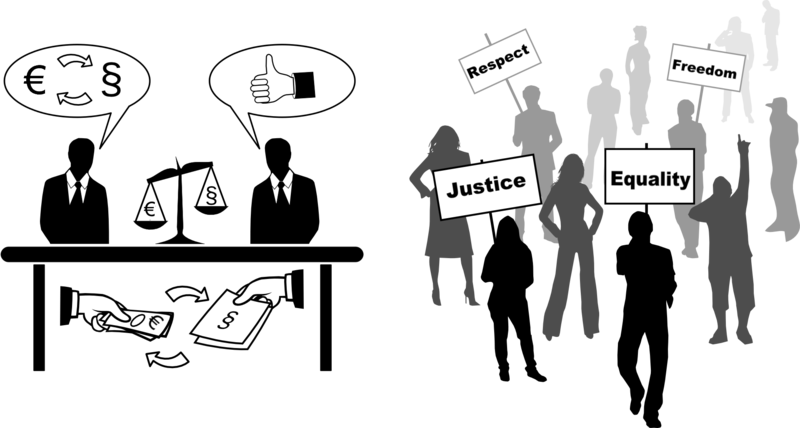 The transparency register is meant for professional lobbyists, whose business is trying to influence legislation on behalf of a group or individual who hires them, as well for “promotional groups” or “public interest groups“, which do not lobby for their own interests, but to protect a specific section of society, to change people’s attitude on a particular issue or to achieve certain political objectives. No. 12of the guidelines: Activities in response to direct and individual requests from EU institutions or Members of the European Parliament, such as ad hoc or regular requests for factual information, data or expertise, are not covered by the register. Our partner ANARMA is listed in the transpareny register. Yet when it requested a meeting with the ESSC which is supposed to act as a “bridge to civilians”, it was denied the chance as they have no interest whatsoever in listening to their point of view. ANARMA was even in danger to be deleted from the register. EU doubted that a organisation with only 750 paymembers and unsalaried member of boards could be a called “lobby”. Ford, in a post on her Facebook page, had also thanked FESAC, along with other groups, for their “technical advice”. Why did the author write “technical advice” in quotation marks? He seems to imply that FESAC’s advice was anything but technical, which is not the case. Law-makers need technical advice from expert stake holders. When the Commission wrote the regulation on deactivated firearms without seeking such advice it produced a document that is riddled with errors and which is mostly un-implementable. It now has to be revised..
And who does the author expect to provide sound technical details on firearms? Lawyers? Politicians? Is it not obvious to him that proper information is best obtained from the manufacturers, owners and collectors who are well-versed in the subject? The accompanying chart shows how people with the correct technical knowledge interpret legislative acts. 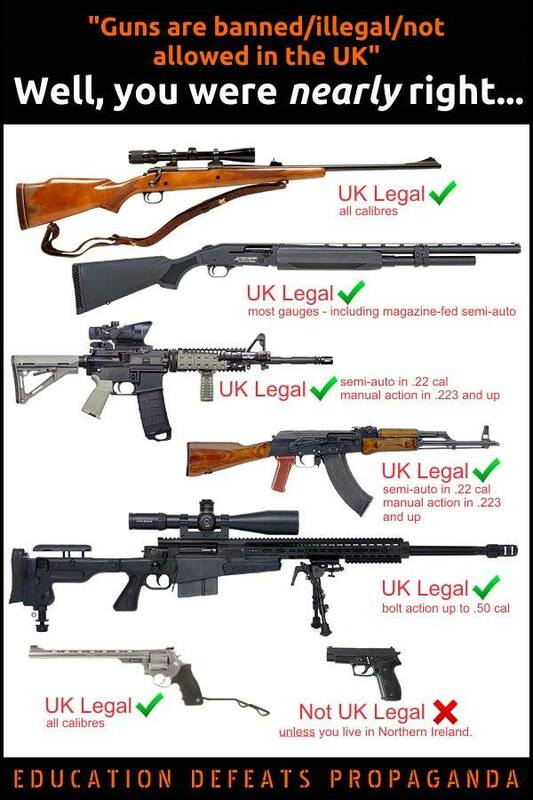 Whilst politicians and the general public believe that firearms are banned in the UK, all the firearms shown, except for the pistol can be legally owned in the UK. Besides, statistics prove that the UK handgun ban had no impact on gun crime. It only affected legal owners and traders. Interest Groups in the European Union: How Powerful Are They? Andreas Dür from theUniversity of Salzburg published this paper in 2008. It has been quoted over one hundred time: Dür, Andreas. 2008a. “Interest Groups in the European Union: How Powerful Are They?” West European Politics 31(6):1212–30. We are quoting some relevant phrases from this paper. Interest groups’ resources mentioned in the literature include money, legitimacy, political support, knowledge, expertise and information, means technical advice. Interest groups may dispose of financial means that they can use either to support an incumbent or a challenger in electoral contests. Pro-gun groups do not have the required financial resources to utilise this tool. By dealing with certain political or bureaucratic actors (in particular officials that are not directly elected, such as those in the European Commission), interest groups may also be able to convey legitimacy upon them. The Commission shunned the sound technical advice offered by stake holders and experts as it did not suit their agenda. This did weakened its legitimacy. Most importantly, interest groups may have knowledge, expertise and information that can facilitate the task of decision-makers (Crombez 2002; Hall and Deardorff 2006). This was not appreciated by the Commission which uses the media and national authorities to discredit us. Interest groups, moreover, can express their support for a politician in exchange for policies that favour their economic or other interests, which may influence the voting decisions of a rationally ignorant electorate. The Euroscepticism generated by the Commission’s actions will not go unnoticed in upcoming national elections. They may opt for arguing rather than bargaining, with arguing being aimed at changing the beliefs and preferences of decision-makers. Information then is used not in exchange for influence, but to convince decision-makers of the merits of a proposal. Arguing can also be directed at the broader public, with the objective of changing the framing of an issue in public debate. That is precisely what the representatives of legal firearm owners, particularly FIREARMS UNITED are doing. We provided the facts and the impact of the proposal as a solid argument to reject this biased proposal, which was presented with wrong arguments and false accusations. While our conference in November and our press releases have been largely ignored, the mass media has disseminated Commission statements without any form of critical comment. Consider the following three examples, which are ideological and unsupported by facts. 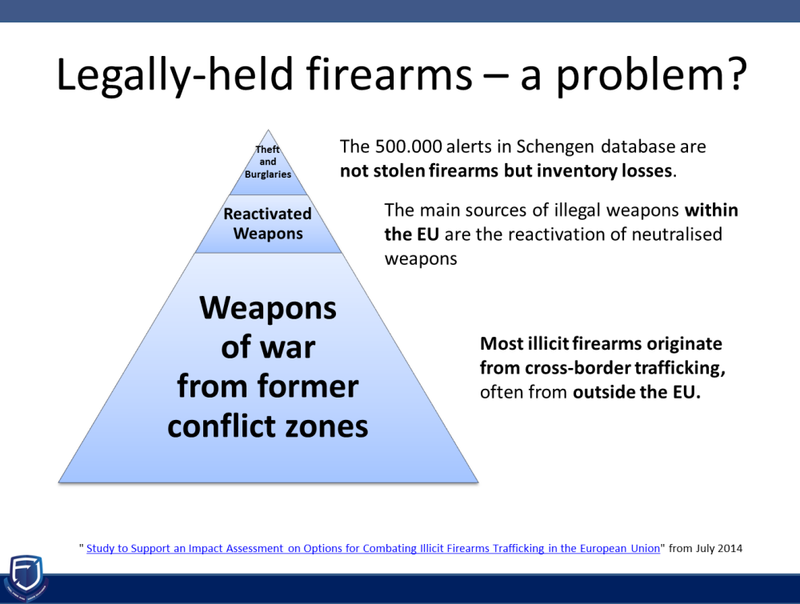 Illegal Kalashnikovs circulate freely in the black market with its open borders, but not in the legal single market which is already heavily regulated. Legal firearms do not present any threat to public safety. Terrorists or organised criminals do not use firearms in the rare cases when they are stolen from civilian owners. Their sources are those that are smuggled into the EU (two-thirds) and those were reactivated illegally after poor conversions in some member states thanks to lack of enforcement (one third). The proposal does not change this situation. But it will criminalize every unregistered owner of properly converted weapons over night. None of the severe restrictions proposed by the Commission will reduce mass murders in a tangible way. Consider the terrorist attacks in Nice and Berlin in which trucks were used with tragic effect. Not even the horrible attack on the island Utoya in Norway would have been prevented, neither the one in Cumbria (UK) with a rimfire and a hunting rifle. Interest groups should find it difficult to influence policy outcomes when the public is highly attentive to an issue. [T]he bureaucrats in the European Commission do not have to fight for re-election; this may make them less receptive to interest group demands simply because they do not rely on resources from interest groups for a re-election campaign. Commission is quite autonomous in developing its preferences, and then seeks support from groups that have a similar preference. Irina Michalowitz (2007), for example, argues that groups can only exert what she calls “technical” influence; they cannot change the core aspects of proposals presented by the Commission. Interest groups’ influence has even been seen as depending on the “goodwill” of relevant policymakers in the Commission. The inter-institutional dynamics between the Commission and the Council of Ministers may also limit interest group influence. Furthermore, interest groups may use the “voice channel” to influence political processes. Groups can “make noise” by way of manifestations, rallies, petitions, statements in the media, and participation in public debates. The voice channel also includes influencing referenda or citizen initiatives, for example by way of campaigning (Gerber 1999). Groups can try to attain two objectives with such “outside lobbying” (Kollman 1998): on the one hand, voice may be aimed at influencing public opinion in favour of the demands of certain groups. For this, an initial coincidence between public and private interests (or at least the adequate framing of an issue as advancing the public interest) may be necessary. By being very vocal we have given Rapporteur Vicky Ford and her shadow rapporteurs much support in amending the proposal on a technical basis. An outright rejection of the Commission proposal is difficult to achieve at this stage since public opinion is influenced by the Commission’s biased arguments while our national governments generally supported the Commission and not Parliament. 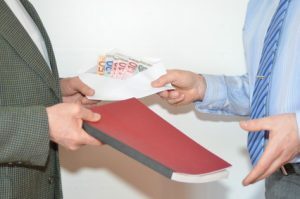 The legislative process in the European Union has often been criticised over the lack of transparency when it reaches the stage of “informal trialogue”. The Commission uses these meetings, which are held behind closed doors hidden from public scrutiny, as an occasion to bully Parliament into submission, often with support from Council. The democratic process is stifled at this stage as any contribution by civil society via their elected MEPs is effectively blocked out.